One of the best things about being true to yourselves as a couple is that you inherently give permission for others to follow suit. And sometimes when it comes to deciding whether eloping is for you or not, been-there, done-that community support is just what you need to commit to a private ceremony and celebration. Bethany Lester and Mark McGuire get it and invite you to their elopement at Folly Beach to see if it might be just the thing for you and your beloved, too. There’s so much to learn from these two Lynchburg, Virginia, residents and their photographer, Demi Mabry. Read on! Charleston Weddings: Bethany, why did you and Mark choose to elope? Bethany: We had both been married before and felt like an extravagant wedding and reception weekend wasn’t really “us.” With this new chapter we wanted the focus to be on each other and the simplicity of just sharing an intimate day blending our lives and stepping forward together. CW: Gotcha. You live in Virginia. Why did you pick Folly Beach? Bethany: The ocean is my happy place, it’s where I feel closest to my creator and where I feel my soul at rest. Mark knows this, so he suggested we get married by the waves. At first we thought we would go out of the country but then decided on a beach within driving distance. We used our plane money on delicious Charleston food instead. CW: How did you know about the nature preserve across from Morris Island Lighthouse on Folly? Bethany: My brother had been stationed in Charleston in the Army and he and my sister-in-law had brought us to this very beach. Demi: This is one of the benefits of hiring a photographer who lives in, has lived in, or works in Charleston often. As a previous resident, I knew spots where tourists wouldn’t be. CW: Did you need a permit to photograph there? Demi: For our specific location on Folly Beach, we did not need a permit. However, a lot of places do, so always make sure to look into logistics. There would be nothing worse than to begin shooting and be asked to leave because you didn’t check to see if you needed a permit. Demi: Most of the time I can get a feel for if a couple and I would be a great match via e-mail and a Facetime call (two things I do with all of my clients). Usually, I know we are good when they are genuinely excited about their elopement, excited to be working with me, and the conversations are easy and don’t feel forced, and when they are open and eager to tell their story. Bethany: My dear friend Demi Mabry and I have worked together in a side health and wellness business for years. So with Mark and I being a little awkward in front of the lens she was the absolute perfect fit with her playful and joy-filled personality that put us right at ease. CW: Were photos important to you and Mark? Bethany: I absolutely love photography and the excess of 50,000 photos on my phone alone will tell you just how much I cherish pictures and the stories they can tell. I knew photography would be the only part of the ceremony I would be picky about. Bethany: Here’s a little funny backstory: Our favorite little date spot in Lynchburg is Craft Beer Cellar and the owner, Ryan Maas, just so happens to be ordained. So instead of trying to coordinate someone we didn’t know to meet us in Charleston, the day before we left for our trip, we stopped by Ryan’s and had the now aptly nicknamed “Minister of Malt” make it official. Then we toasted to forever with our friend and a mug of good brew before going home to pack our bags. For the ceremony on Folly, we wanted something simple that felt like more of an intimate conversation as we spoke aloud our promises, so we decided to write our vows and read them to each other, just the two of us and our photographer. CW: Demi, have you shot elopements before? Demi: This was my third. Elopements are so couple-focused and I think that’s so incredible in a day and age where sometimes the wedding can sometimes (unintentionally) climb to a higher priority than the relationship. Eloping, to me, is one of the most beautiful things a couple can do to demonstrate their love and the start of their life together. The ceremony isn’t for show. It’s not for the vendors. It’s not for the photos or the video. It’s for them and only them. So, to me, an elopement means that two people in love are so head over heels for each other and can’t wait for a single second longer to marry each other. How beautiful is that? CW: How do you shoot elopements versus a full-blown wedding? Demi: Just as every couple is different, each elopement is different. Since it’s a wedding day on a much smaller scale, I get to know my couples beforehand and understand their reasons as to why they are eloping. I love to hear their thoughts about their elopement and why specifically it’s so special for them. That way, when I show up, I’m filtering every shot I take through that frame of mind—through their story and ultimately, through their mindsets. CW: Anything else to add? Demi: Elopements are not for every bride or every photographer. 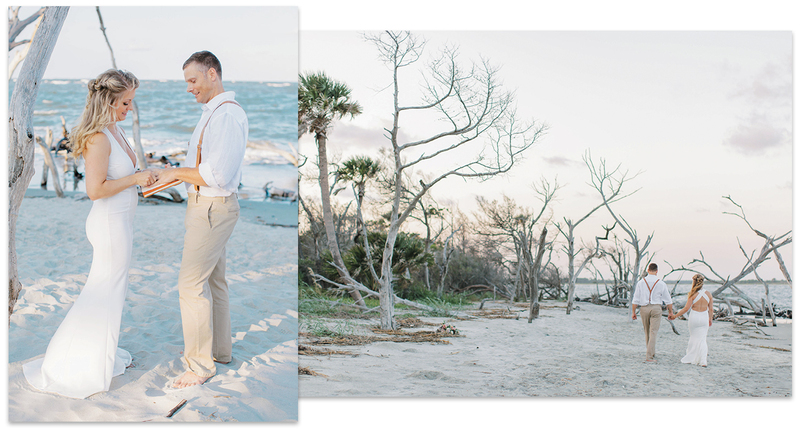 For me, shooting elopements circles back to the reason why I do what I do. I pick up my camera not only for my bride and groom but for the generations to come. I solidify memories so that the couple can be present in the moment. I capture their legacies so that they may cherish one of these fleeting moments of life. Bethany: “Our close family knew our plans, so my sister-in-law had secretly coordinated everyone to send letters from all over the country (and even Canada). She wrapped them up in a beautiful floral cloth box for us to open at our dinner downtown after the ceremony. We sipped prosecco and read—through tears—the letters so prayerfully written for us from some of the most important people in our lives. Morning: The couple relaxed on the beach, reading and fishing. Noonish: Bethany headed downtown to get her hair and makeup done. Early Afternoon: Photographer Demi Mabry met the couple at their AirBnB on Folly, took the items they wanted for detail images (vows, cigars, bourbon, etc.) and snapped flat lays. Afternoon: The trio rode to the east end of Folly, parked, and walked the half-mile to the beach. (They told Demi the story of their courtship along the way.) Once at the shoreline, they recited their vows to one another, then danced to Dave Matthews’ “You and Me” thanks to a portable speaker Mark brought. Late Afternoon: They spent about an hour getting portraits made. Evening: The couple headed into town for an intimate dinner at Zero George … and announced their marriage on social media with a photo from the ceremony captioned with a prayer.